1. Do I have to make a long-term commitment? We offer month-to-month leases, which means there are no contracts and no commitment. Additionally, our facilities offer discounts for long-term storage. If you know the amount of time you will be storing with us, you can save by prepaying your rent. 2. When can I access my unit? Most of our facilities are open 7 days a week. Office hours and access hours vary by location. Please select a location for hours and features. 3. Will my belongings be safe? 4. Do you require/provide insurance? Yes, we do require insurance. You may provide a copy of your homeowners insurance policy or you may participate in our protection plan, The StoreSafe Lease Program. Please click here for more details! 5. How much notice do I need to give to move out? We require a 10 days written notice to move out. Full details on the vacating policy will be provided to you at the time of move-in. 6. Do you offer boxes and packing supplies? All Storage Direct Self Storage facilities offer a wide variety of storage merchandise including boxes and packing supplies. 7. What is an On-Site Manager? 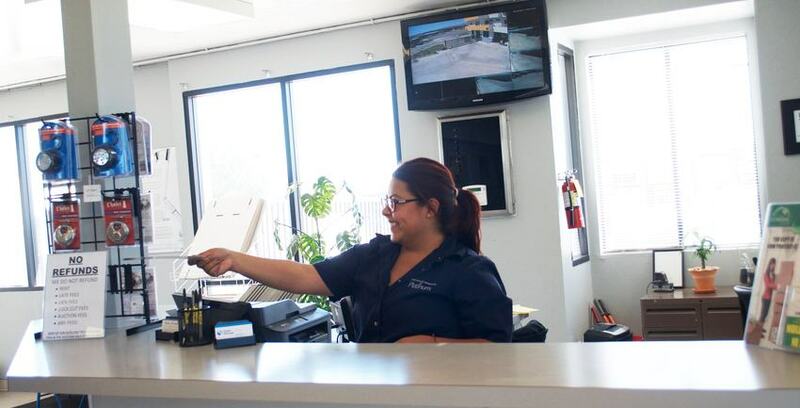 On-Site Managers reside on the facility grounds and provide extra security and service for our customers. 8. Are drive-up units available? Some of our facilities offer the convenience of drive-up units that allow you to load and unload your storage items directly from your vehicle into your unit. 9. What are climate controlled units? Some of our facilities offer climate controlled units to protect your belongings from extreme weather conditions. Temperatures vary by climate and region. 10. Can I store a RV/Camper/Car/Boat? We offer RV/Camper/Car/Boat storage at select locations. Please visit our Locations page to see if the facility nearest you offers that feature. 11. Are there moving trucks available? Various locations offer moving trucks. Please contact a facility near you or visit our Locations page for full details. 12. Are the facility details provided on the website standard for all Storage Direct storages? Unit sizes provided are approximate. Unit features, pricing and availability vary by facility. All discounts and coupons are subject to terms and conditions based upon location and unit size. 13. What are the terms and conditions of this site? Storage Direct Self Storage make no warranties on this site and its terms are subject to change at any point in time. Storage Direct is not responsible for technical difficulties of any sort including a network failure or delayed connection. In addition, Storage Direct will not be held accountable for the use or content of any websites accessed through or provided by this site. 14. How does self-storage work? California's technical term is "Self Service Storage Facility". We provide you with your own individual self storage space. You are responsible and retain control over your stored goods, pursuant to the terms of the rental agreement. You secure your self storage unit with your own lock and key. You can access your goods during the gate hours. 15. What are your storage rates? Storage Direct has very competitive rates. Since prices are based on availability and different factors, the easiest solution is to visit us or call and speak directly with our self storage consultants or managers. Call us today to find out about our move-in specials! 16. What is the minimum time that I can store for? There is a minimum rental period of two weeks and because we have a month-to-month agreement, there is no time limit as to how long you can store. 17. What if I forget my gate code? Not a problem! Just present satisfactory evidence that you are the person that signed the rental agreement and we will gladly give you your gate code. Unfortunately, we are unable to give a code over the phone or to anyone else other than the tenant who signed the rental agreement. 18. Who can enter my storage? The person who signed the rental agreement may give their code and key to anyone they choose. Anyone who has been given the code and key by the original tenant has implied consent to be on the property. 19. How can I make my payment? There are several ways to make a payment. Here are just a few: mail, phone (signed authorization form required), automatic payment via your debit or credit card (signed authorization form required), our overnight drop box (no cash please), or simply walk-in during business hours. 20. Do I have to pay first and last month rent? No, we prorate you for the first month only, which makes your up-front costs lower. 21. Can I transfer units at anytime without a fee? Yes! We do not charge transfer fees. You may move up or down a unit size anytime. 22. Can I really access my storage unit on holidays? Yes! Remember you have access 365 days a year! 23. Do you have employees that speak Spanish? 24. Did we answer your questions? Please feel free to contact a facility near you or email support@platinumstorage.com for additional information. What does Storage Direct do? **For student renters in Spokane, Washington - Offer is subject to change without notice. Offered only on selected units at selected facilities. Offer is subject to availability. This offer applies only to new customers signing a rental agreement with the three-month prepaid, rental fee. Offer is not available to existing tenants requesting to transfer to another unit or renting additional units. Other restrictions, taxes, and fees, including an administrative fee, apply. Offer is only good for students with a current college or university student identification card (“ID”). A current college or university student ID must be presented to facility to receive offer. You must be 18 years or older to be eligible for offer. One gift-card per Student. Valid on rental agreements executed between April 18, 2019 and July 31, 2019. Gift cards received through this offer are not redeemable at time of execution of rental agreement. Offer may not be combined with other discounts or promotional offers. No replacement if gift card is lost or stolen. For more information, please contact your local facility manager.